BURNING QUESTIONS PART I: DID TY VICKERY GHOST US, CAN THE TIGERS REALLY WIN IT ALL AND WILL ABLETT STAY A SUN? Burning Questions will appear during the 2017 AFL Grand Final Series. It will look a many questions that need answering to issues or thoughts that have gone unnoticed or ones that need a definitive stance. This is Part I. 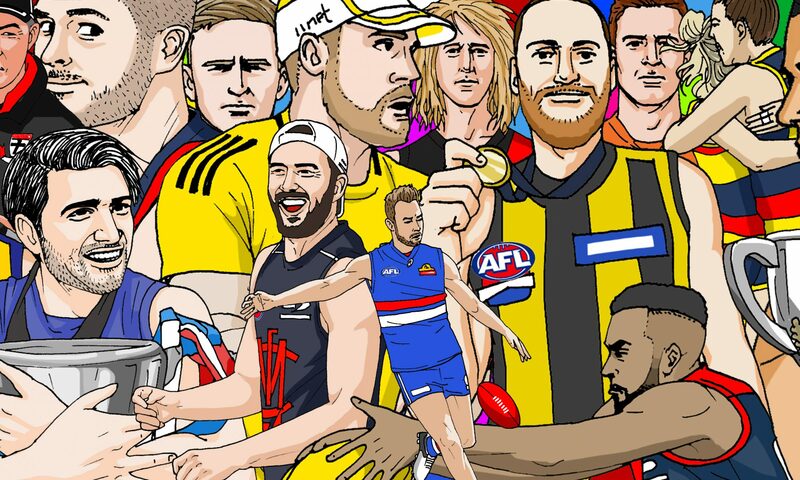 Is there any way the Fifty can produce their own All-Australian that is more inclusive of every player, more of a celebration of AFL, rather than scraping together a top elite list based on stats? YES! Funny you say that. Next week we are publishing the “2017 Travis Cloke All-Australian Team”, a team praising all kinds of AFL players who deserve kudos. It’s going to be great. And an annual Fifty tradition. Stay tuned for that! Andrew McGrath won the 2017 Rising Star. Was he really a deserving winner considering the seasons of Powell-Pepper, Burton and a string of others? You’d be a brave punter to suggest otherwise. I don’t know, I thought he was a clear-cut choice, with Burton a close second and Powell-Pepper with the bronze. Let’s put statistics aside, if you watched McGrath’s matches, he played with a sense of calm and poise. He looked like he’d been playing at the AFL standard for years. You could argue Powell-Pepper did the same at Port, and Burton at the Hawks. For me, it boiled down to McGrath’s impact in defence, as a rebounder, or lock down defender (remember his stifle-job on Eddie Betts?) or link-up player on the wing. As I wrote for the Onballers, he has that Wanganeeness about him, a comparison shared by many, which is not that much of a stretch to say. Can the Tigers really win the flag? The last time the Tigers won a flag was 1980. During the 90s the Tigers had a rotating door of coaches. The 2000s became a time to rebuild and that period came with hulking losses. It’s been tough for Tigers fans. Throughout, any successes the Tigers had, have been met with extremely high expectations because when you’re a starved fan, you have to enjoy anything that resembles winning. This year, they’ve looked as settled as they’ve ever been. Damian Hardwick came out and said this is the best Tigers group he’s coached. And he’s right. Now they have the weapons to go deep: the elite goal-kicking midfielder in Dustin Martin, All-Australian full back captain Rance, a 50-goal season from Riewoldt and a string of mids, talented rookies. Their biggest hurdle will be themselves; everything from capitalizing on their time with the ball (something they didn’t do against the Cats), to conquering their inner demons and previous nightmarish finals campaigns. If they do win it all, can you imagine – just imagine – the Tiger Army party? Did Ty Vickery ghost us all this year? Well, let’s not give Ty Vickery that much credit. To ghost someone implies a calculated disappearance. Vickery spent the majority of 2017 in the VFL wasteland – and not by choice. This year in six matches he took 14 marks, kicked 2.6 and barely got much of the ball outside of that. Off the field he appeared more lively when he was involved in an extortion case with former Tiger Jake King. Basically, what we all thought about Vickery, came true. How could a middling Tiger forward fill gaps at the Hawks? Vickery averaged eight touches in 2016; the same amount of touches he averaged in 2009 when he first joined the Tigers. The fact that he didn’t evolve in eight seasons makes it more ambiguous as to why the Hawks picked him up in the first place. What the Hawks saw in him will forever be a mystery. Did you expect Hibberd to have the year he had at Melbourne? Yes and no. Yes, because before the 12-month suspension, Hibberd was an emerging talent. His defensive marking in packs, intercepts, rebound and raking left boot caused headaches for opposition teams. Bombers fans saw the Hibberd departure as a huge loss. Lucky for them Marty Gleeson has filled that hole. But, Hibberd had a great foundation. What made me think twice about Hibberd was his ill hamstrings that sidelined him for weeks at the Bombers and the fact he had 12-months off from the game. Like any of the ‘Essendon 34’ question marks remained over whether or not those players could pick up where they left off. Hibberd, has done that. My prediction: he’ll win the Demons best and fairest and that would be an impressive feat. What’s going to happen with Ablett Jnr and the Suns? Ablett Jnr is in the twilight of his career and the Suns are flatlining. I’m finding it hard to care about this result, but odds are stacked in favour of Ablett Jnr. making a return to Skilled Stadium in 2018. Nathan Buckley is coaching the Pies again next year. Is that a good thing? About half way through the season I thought Bucks was toast. He probably did just enough to keep his job. It’s funny what a big difference a couple of wins makes. The Pies went 9-12-1. Had they gone 6-16, it may have been harder for Eddie to keep Bucks. But, like the Tigers who stuck it out with Hardwick during some difficult spells (the 2016 season of 8-14, the 8-13 year in 2011 and 10-11 season in 2012), the Pies are opting to do the same. If Bucks and the playing group are tight – by all reports they are – then stability and sticking it out means more for the club than a fresh slate. Should Nic Naitanui play in the Elimination Final against Port Adelaide? Um. Are you kidding me? The question is: are the Eagles going to win a flag? Answer: (sorry Eagles fans) No. This isn’t their time. They scraped into the finals by the skin of their teeth, which is to say, they’re really making up numbers this season. I could be wrong. This season has dished up some mighty curve balls and you only need to look at last year’s Bulldogs to know, really, anything could and might happen. But playing Nic-Nat in a cut-throat knockout final just doesn’t make sense. What makes sense is playing football hardened Drew Petrie. He’s of more value than Nic-Nat right now. If the Eagles did play him, it seems like a huge risk with little reward. They’ve gone the whole year without him. Wrap him up in cotton wool for 2018. It’s not even a discussion. But seriously, what happened to the Bulldogs? The competition got better. What is Gillon McLachlan going to do about the deliberate out of bounds rule? He needs to do something. The current interpretation of the rule is brutal and messy. And if anything, if we only adjust one part of the rule, this is the part we need to fix for 2018 and this scenario right here: If there is no-one to kick to, and the player kicks to space, only for the ball to do a 90 degree turn and bounce over the boundary line — THAT IS NOT DELIBERATE. There’s nothing wrong with a clearing kick that dribbles over the line. It’s OK if play needs to reset every now and then. Everything else seems to be set to break-neck speed. We don’t need a deliberate out of bounds deciding results of games or turning momentum of games. It’s bizarre to think that it could. Does Worsfold need to win a Bombers flag for him to be lauded as the 2017 coach of the year? What Worsfold has shown is that he’s one incredible guy. Football journalists love talking about strategy and analytics, but sometimes what’s missing from a coach is personable skills. How to relate to players. How to teach them not only football lessons, but life lessons. Worsfold is both: a man with a tactical vision and a calm leading figure. The Bombers are a dangerous team when “on” and now they’ve developed ways to win even when things are clicking or they’re down on personnel. They have depth now and aren’t as predictable as they once were. Worsfold’s Bombers are still a work in progress. They still turn the ball over when under fierce pressure. Most of us rank success with wins and losses, and true, it’s a good indicator, but the work Worsfold has accomplished at the Bombers in a short period of time runs far deeper than that. For now, he continues to be the catalyst to fix the Bombers’ problems. If Toby Greene had to be cast as a villain in a Hollywood movie, what top five characters would he play? I worked a list of 15 movies down to a top five, based on Toby Greene’s puffy chest persona, his ability to find unfavourable things that draw attention to him, his athletic ability and bullish antics. Ok. I think I have this right.